Discussion in 'Sheaths & Such' started by Gary W. Graley, Jun 18, 2018. 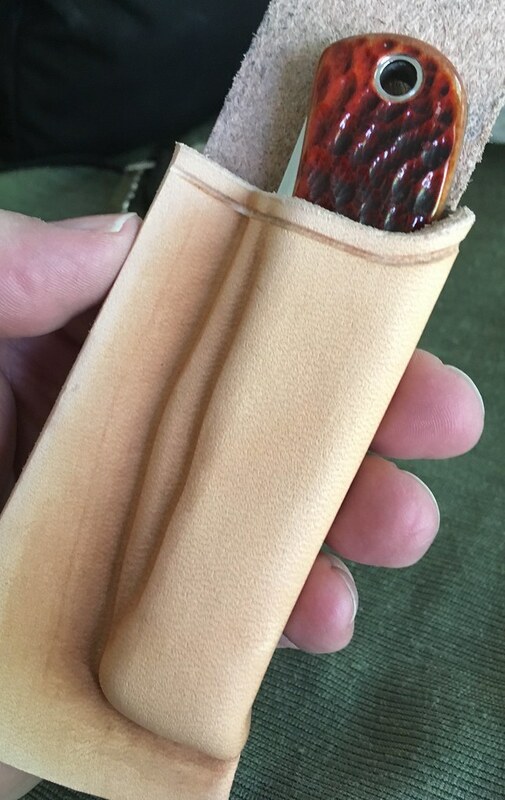 A fellow had a request for a sheath, but didn't want just a dyed type sheath, I thought of Dave Ferry's, aka Horsewright, tutorial he had on making pancake sheaths seen here via this link Thanks again Dave for taking the time to make that great thread. 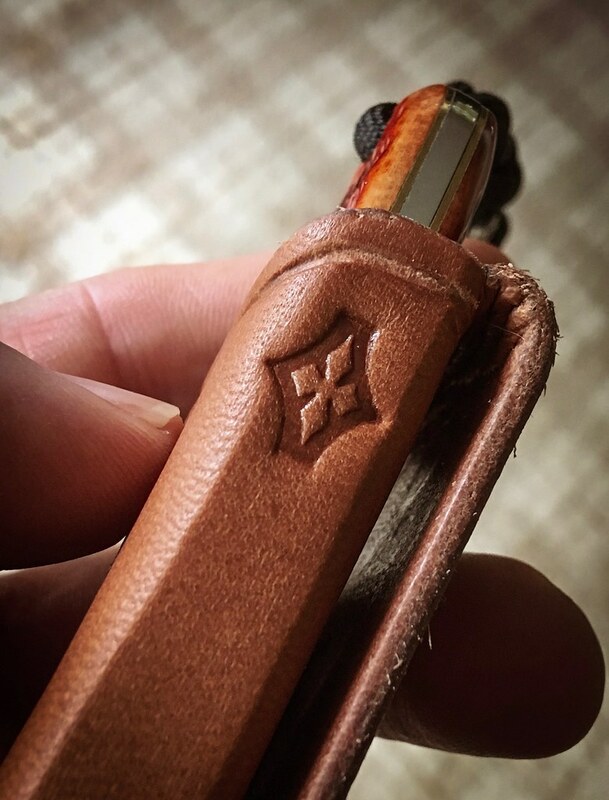 The reason I thought of Dave's tutorial was the neatsfoot oil process he uses on his sheaths, I seem to recall ages ago that I gave neatsfoot oil a try but the leather was just blah looking, like raw leather. The step I was missing was the oven time that Dave spells out, again this is his method and he does warn others to use that with caution, but, I wanted to make something that would not be a dyed sheath and this was the only thing I could think of. Trying something new, especially AFTER you have done all the hard work of making the sheath, is a little unnerving to say the least! But it turned out pretty good, the oil is still settling and Dave does warn about that stating he had one that took almost a months time before it all settled out evenly. Right now this sheath has the top half still darker than the lower half but it is slowly blending/settling. and the sheath now sewn up and waiting to be popped into the oven, Dave's tutorial spells that out pretty good, my stove was able to be set to 170 degrees and as he warns, do NOT put the sheath in while the stove is preheating! As during the preheat stages the oven can ramp up much higher to get to the temp you are setting and you can destroy your project ! I sat the sheath on a layer of card stock so the grill wouldn't leave marks on the sheath. Here you can see the top section is a tad darker than the lower area, as during forming there was more stress in that area so I think the fibers were tighter and the oil didn't soak in as much as the top half did. The one thing with using the neatsfoot oil is my usual snap into place isn't so 'snappy' due to the oil that is also inside as well, but, with the shape of the blade's spine and handle shape, the knife has very good retention and would not be coming out on it's own. I had worried about the sheath shrinking from being in the oven, as my sheaths are formed quite tight to the knife, but that didn't seem to affect it, but then, as I am forming the leather, I am pulling/stretching the leather to take the give out of the leather. 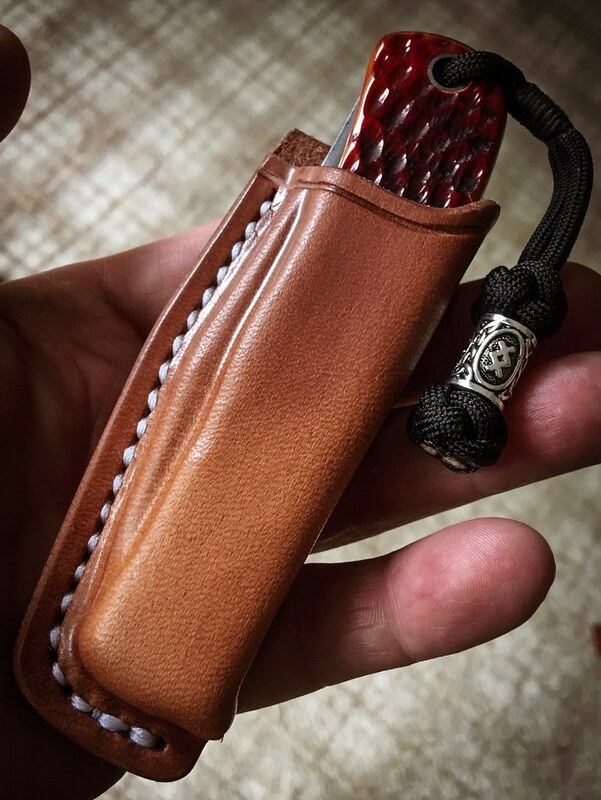 So, again just a thanks to Dave, as I did bug him via private message for any tips when making just one sheath and as usual he was kind enough to respond back right away. GABaus, TheFactor, Phill50 and 20 others like this. That came out great. The clean stacked ends look pretty neat with just the oil finish. GABaus and Gary W. Graley like this. 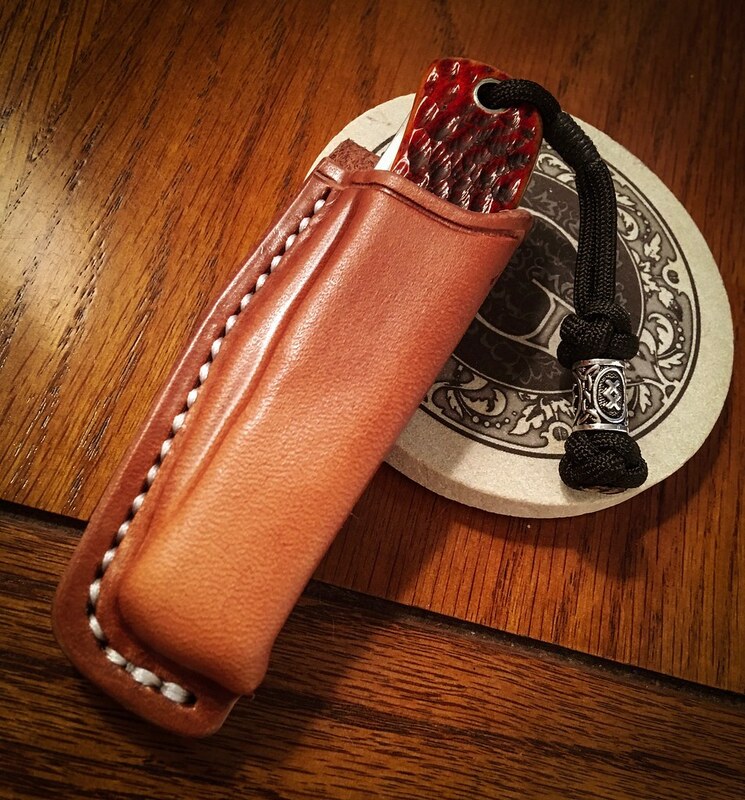 Really nice write up And that sheath looks really really good !! Thanks guys and yes that is the Tiger 1.2mm thread, at first when I sew'd it up it didn't look very white, but after the oil treatment it came back with better contrast and showed white a bit more. Rick Otts, Justin.P, [email protected] and 4 others like this. Getting older and Gary W. Graley like this. Fantastic! 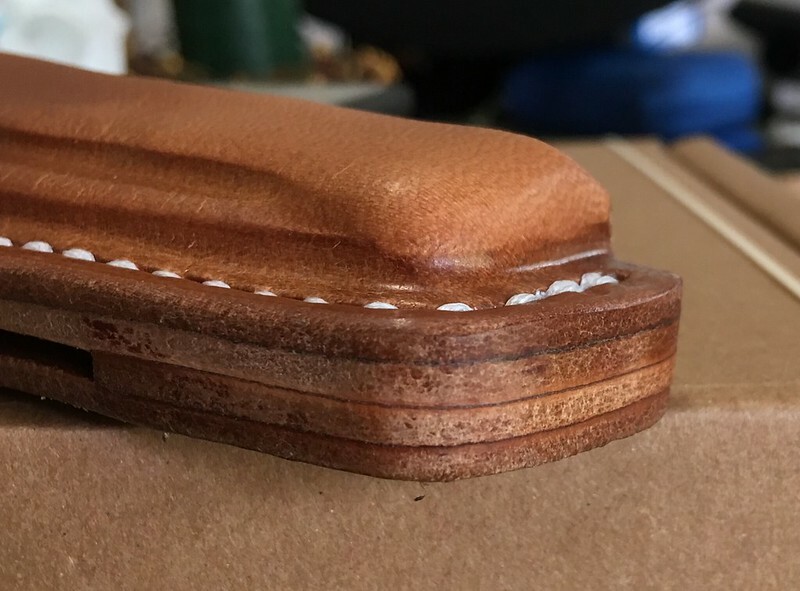 I've done a few "tanned" leather pieces using neatsfoot, but I sat the leather out in our rather intense summer sun and it gave the leather a very nice saddle tan color in a few hours. I think between the heat and the suns rays it was able to give a slightly darker tone to the leather. If I can find that journal cover I did for the wife back then I'll post up a picture so you can get a better idea. Its amazing what nature can do. Horsewright, Gary W. Graley and hughd like this. That looks great Gary! How come you started adding the extra layer? 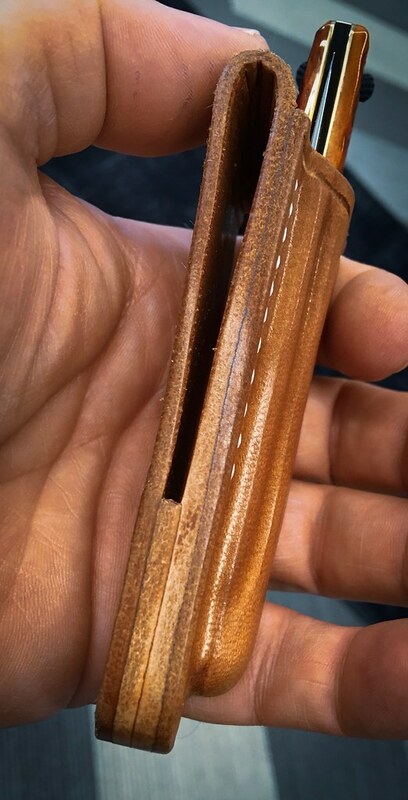 As to the added layer, it's more of a shelf, it doesn't run the entire length of the sheath. I started doing this not too long ago as I thought it would make a place that the belt would hit against instead of into the area where the stitching is, plus it adds a little bit of rigidity to the overall feel of the sheath too. A little more work but I think it adds something that folks would appreciate. varga49, Getting older, GABaus and 7 others like this. Thanks Dave, as you can see the one side there I can sand flush with the edges, on the other side I can't do that up higher so I angle the small piece to drop down to where it is sewn at the bottom. And the more I handle and look at this sheath, I really do like the look of the oiled finish, not sure how this will work on my horizontal style sheaths but I may do this more often or at least offer it. 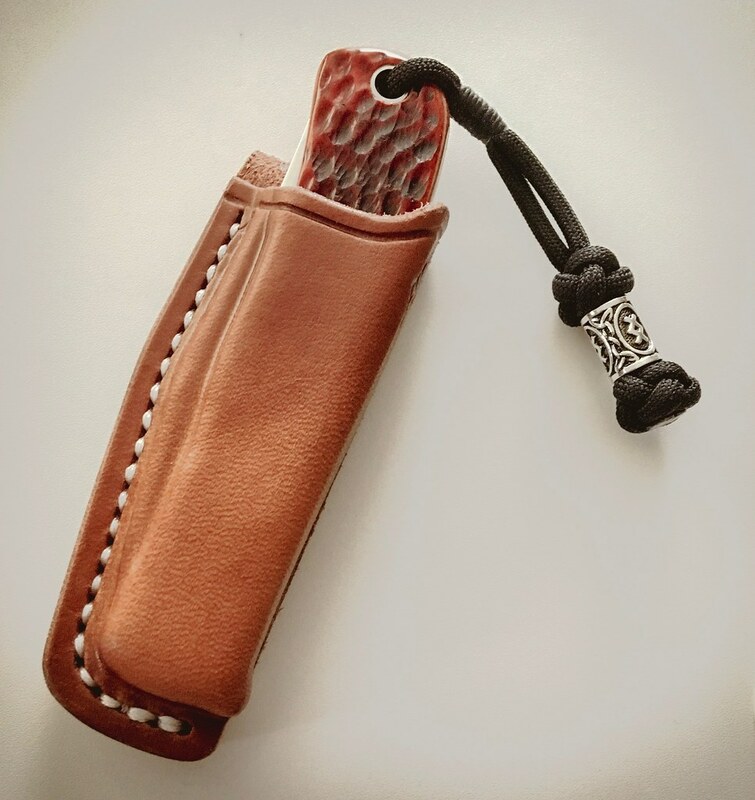 Do you think the " Snap " and rigidity of the sheath will inrease as the leather dries and hardens a little over time ? The reason I asked is because I made a few SAK sheaths ( Roughout ) and oiled them instead of dying .
" Witch's Brew " of oil/finish . I found that as the treatment dried it hardened noticeably and the retention increased as the weeks went by . I really like that sheath you made , and I must admit that Dave has turned me to the undyed darkside of sheathmaking . PS - How is the new house ? I use neatsfoot oil most of the time, i just let it bake in the sun though. Once its dry I use saliva and a old piece of denim and buff by hand just like on the sides, it tends to give it a little more polish and in the ones i've used for years, more resistance to weather. And Ken the new place is quite handy to a lot more things, still getting use to seeing people walk by! Lived out in the country for 34 years, suburbs is definitely different! Luckily it is a quiet back street so not a lot of traffic. I like that,very nice work indeed. Good to see ya Ken. Un dyed rough out rocks! We need to start a club. That little horizontal beltless sheath you made me is still brick stout. Getting older, TheFactor, JJ_Colt45 and 7 others like this.